De Officiis (On Duties or On Obligations) is a treatise by Marcus Tullius Cicero divided into three books, in which Cicero expounds his conception of the best way to live, behave, and observe moral obligations. The work discusses what is honorable (Book I), what is to one's advantage (Book II), and what to do when the honorable and private gain apparently conflict (Book III). For the first two books Cicero was dependent on the Stoic philosopher Panaetius, but wrote more independently for the third book. De Officiis was written in October–November 44 BC, in under four weeks. 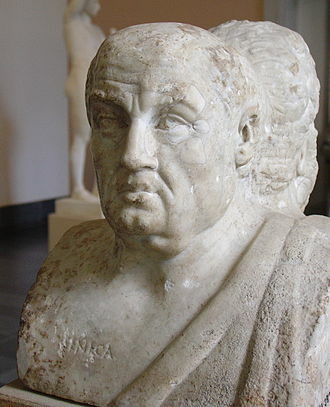 This was Cicero's last year alive, and he was 62 years of age. Cicero was at this time still active in politics, trying to stop revolutionary forces from taking control of the Roman Republic. 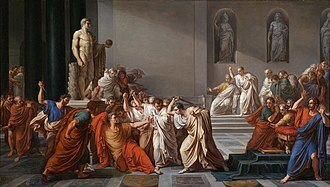 Despite his efforts, the republican system failed to revive even upon the assassination of Caesar, and Cicero was himself assassinated shortly thereafter. De Officiis is written in the form of a letter to his son with the same name, who studied philosophy in Athens. Judging from its form, it is nonetheless likely that Cicero wrote with a broader audience in mind. The essay was published posthumously. Although Cicero was influenced by the Academic, Peripatetic, and Stoic schools of Greek philosophy, this work shows the influence of the Stoic philosopher Panaetius. 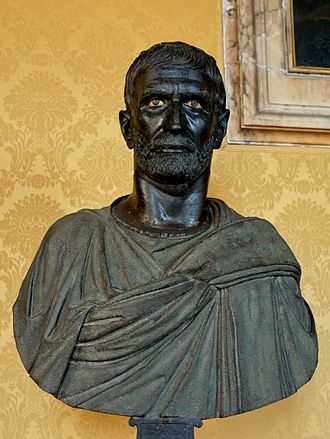 Panaetius was a Greek philosopher who had resided in Rome around eighty years previously. He wrote a book On Duties (Greek: Περὶ Καθήκοντος) in which he divided his subject into three parts but had left the work unfinished at the third stage. 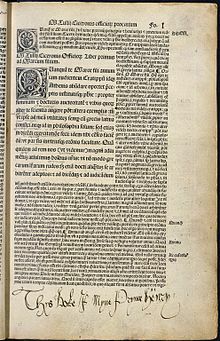 Although Cicero draws from many other sources, for his first two books he follows the steps of Panaetius fairly closely. The third book is more independent, and Cicero disclaims having been indebted to any preceding writers on the subject. Michael Grant tells us that "Cicero himself seems to have regarded this treatise as his spiritual testament and masterpiece." Cicero urged his son Marcus to follow nature and wisdom, as well as politics, and warned against pleasure and indolence. Cicero's essay relies heavily on anecdotes, much more than his other works, and is written in a more leisurely and less formal style than his other writings, perhaps because he wrote it hastily. Like the satires of Juvenal, Cicero's De Officiis refers frequently to current events of his time. The work discusses what is honorable (Book I), what is expedient or to one's advantage (Book II), and what to do when the honorable and expedient conflict (Book III). Cicero says they are the same and that they only appear to be in conflict. In Book III, Cicero expresses his own ideas. 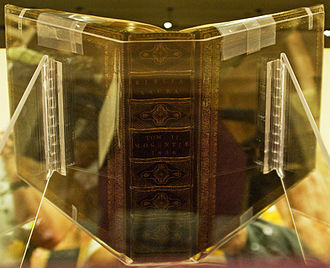 The first book treats of what is honorable in itself. He shows in what true manner our duties are founded in honor and virtue. The four constituent parts of virtue are truth, justice, fortitude, and decorum, and our duties are founded in the right perception of these. The second book enlarges on those duties which relate to private advantage and the improvement of life. The book focuses on political advancement, and the means employed for the attainment of wealth and power. The honorable means of gaining popularity include generosity, courtesy, and eloquence. The third book discusses the choice to be made when there is an apparent conflict between virtue and expediency. True virtue can never be put in competition with private advantage. Thus nothing should be accounted useful or profitable if not strictly virtuous, and there ought to be no separation of the principles of virtue and expediency. Cicero proposes some rules for cases of doubt, where seeming utility comes into competition with virtue. He examines in what situations one may seek private gain with honour. 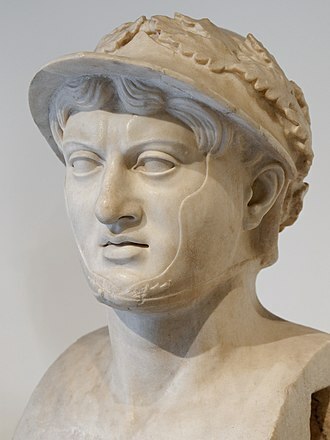 He takes his examples from Roman history, such as the case of Marcus Atilius Regulus who was released by the Carthaginians to negotiate a peace, advised the Roman Senate to reject the proposals, and fulfilled his oath by returning to Carthage. De Officiis has been characterized as an attempt to define ideals of public behavior. 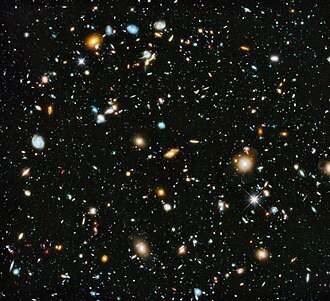 It criticizes the recently overthrown dictator Julius Caesar in several places, and his dictatorship as a whole. Cicero claims that the absence of political rights corrupts moral virtues. Cicero also speaks of a natural law that is said to govern both humans and gods alike. The work's legacy is profound. Although not a Christian work, St. Ambrose in 390 declared it legitimate for the Church to use (along with everything else Cicero, and the equally popular Roman philosopher Seneca, had written). 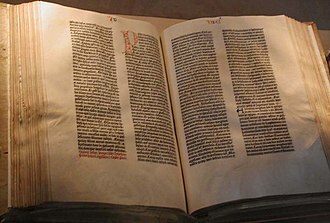 It became a moral authority during the Middle Ages. 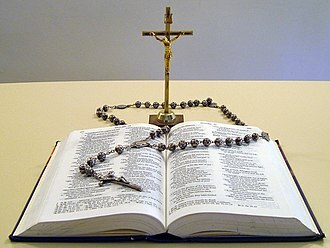 Of the Church Fathers, St. Augustine, St. Jerome and even more so St. Thomas Aquinas, are known to have been familiar with it. 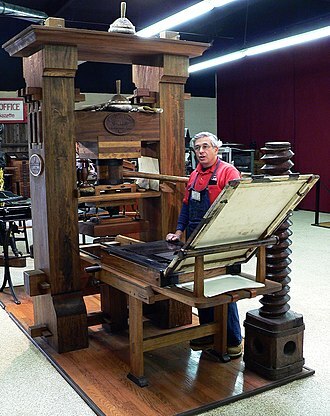 Illustrating its importance, some 700 handwritten copies remain extant in libraries around the world dating back to before the invention of the printing press. Only the Latin grammarian Priscian is better attested to with such handwritten copies, with some 900 remaining extant. 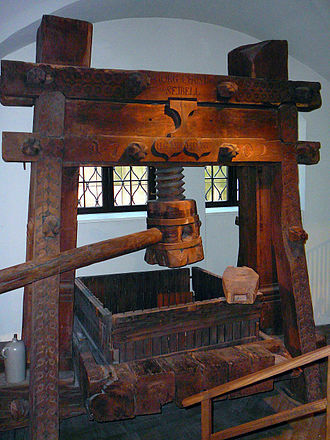 Following the invention of the printing press, De Officiis was the third book to be printed—third only to the Gutenberg Bible and Donatus's "Ars Minor", which was the first printed book. Petrarch, the father of humanism and a leader in the revival of Classical learning, championed Cicero. 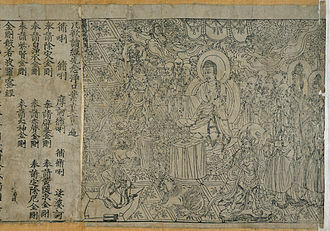 Several of his works build upon the precepts of De officiis. 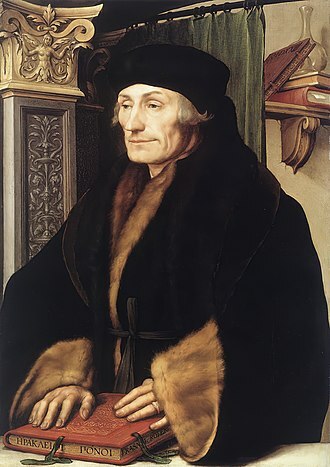 The Catholic humanist Erasmus published his own edition in Paris in 1501. His enthusiasm for this moral treatise is expressed in many works. The German humanist Philip Melanchthon established De officiis in Lutheran humanist schools. Henry VIII's childhood copy of De Officiis, bearing the inscription "Thys boke is myne" in his hand, from the collection of the Folger Shakespeare Library. T. W. Baldwin said that "in Shakespeare's day De Officiis was the pinnacle of moral philosophy". Sir Thomas Elyot, in his popular Governour (1531), lists three essential texts for bringing up young gentlemen: Plato's works, Aristotle's Ethics, and De Officiis. In the 17th century it was a standard text at English schools (Westminster and Eton) and universities (Cambridge and Oxford). It was extensively discussed by Grotius and Pufendorf. Hugo Grotius drew heavily on De officiis in his major work, On the Law of War and Peace. 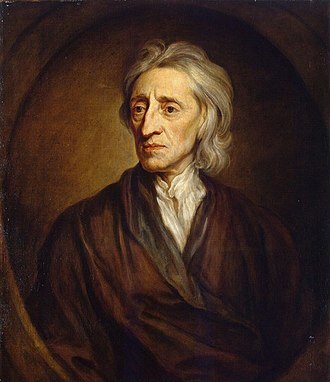 It influenced Robert Sanderson and John Locke. In the 18th century, Voltaire said of De Officiis "No one will ever write anything more wise". Frederick the Great thought so highly of the book that he asked the scholar Christian Garve to do a new translation of it, even though there had been already two German translations since 1756. Garve's project resulted in 880 additional pages of commentary. 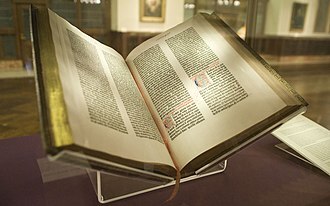 In 1885, the city of Perugia was shaken by the theft of an illuminated manuscript of De Officiis from the city's Library Augusta. The chief librarian Adamo Rossi, a well-known scholar, was originally suspected but exonerated after a lengthy administrative and judicial investigation. The culprit in the theft was never found. Suspicion fell on a janitor who a few years later became well-to-do enough to build for himself a fine house. The former janitor's house was nicknamed "Villa Cicero" by residents of Perugia. De Officiis continues to be one of the most popular of Cicero's works because of its style, and because of its depiction of Roman political life under the Republic. 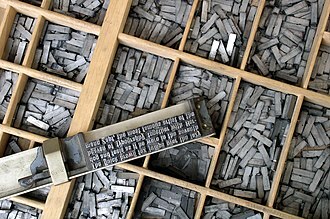 ^ 'The first printed book was not Gutenberg's famed forty-two-line Bible but rather Donatus's Ars Mino, which Gutenberg, correctly sizing up the market, hoped to sell in class sets to schools.' Thus, Jürgen Leonhardt, "Latin: A World Language" (Belknap Press 2013) p. 99. Why Cicero's De Officiis? By Ben R. Schneider, Jr. Professor Emeritus of English at Lawrence University. 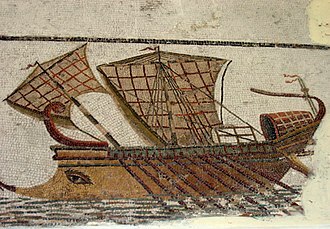 Wikimedia Commons has media related to De Officiis. 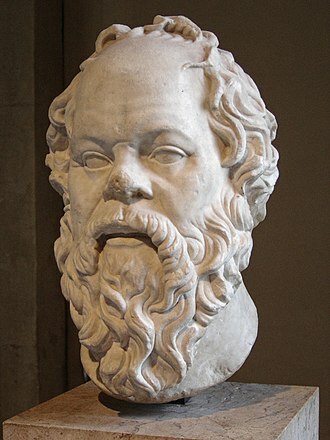 The Nicomachean Ethics is the name normally given to Aristotles best-known work on ethics. 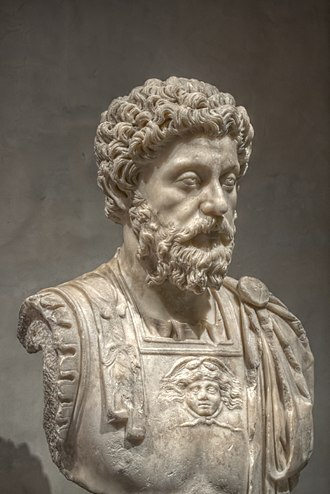 The work, which plays a pre-eminent role in defining Aristotelian ethics, consists of ten books, originally separate scrolls, the title is often assumed to refer to his son Nicomachus, to whom the work was dedicated or who may have edited it. 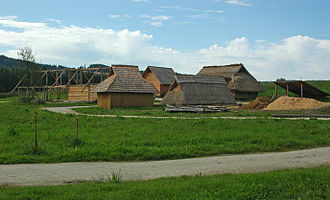 Alternatively, the work may have dedicated to his father. 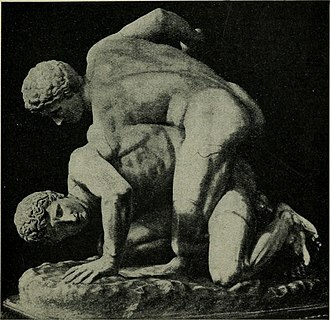 The theme of the work is a Socratic question previously explored in the works of Plato, Aristotles friend and teacher, of how men should best live. 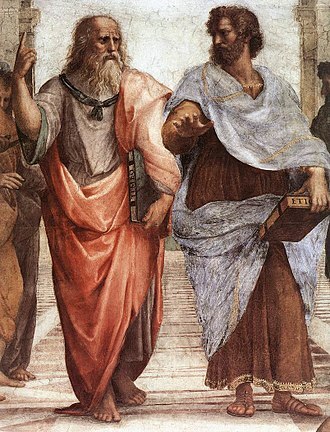 In his Metaphysics, Aristotle described how Socrates, the friend and teacher of Plato, had turned philosophy to human questions, Ethics, as now separated out for discussion by Aristotle, is practical rather than theoretical, in the original Aristotelian senses of these terms. In other words, it is not only a contemplation about good living and it is therefore connected to Aristotles other practical work, the Politics, which similarly aims at people becoming good. Ethics is about how individuals should best live, while the study of politics is from the perspective of a law-giver and it therefore indirectly became critical in the development of all modern philosophy as well as European law and theology. 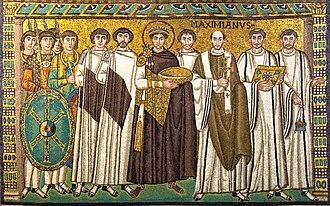 Many parts of the Nicomachean Ethics are well known in their own right, in the Middle Ages, a synthesis between Aristotelian ethics and Christian theology became widespread, in Europe as introduced by Albertus Magnus. 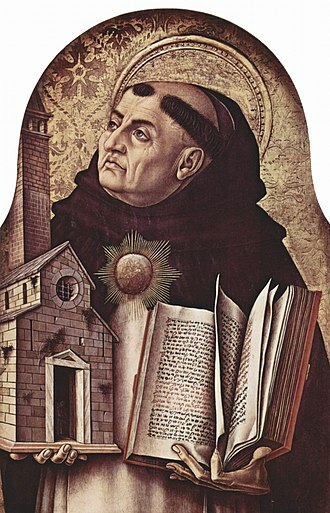 While various philosophers had influenced Christendom since its earliest times, in Western Europe Aristotle became the Philosopher, the most important version of this synthesis was that of Thomas Aquinas. 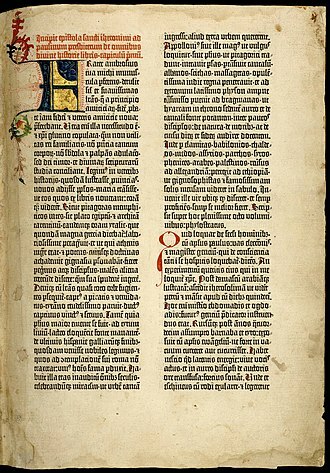 Other more Averroist Aristotelians such as Marsilius of Padua were controversial, however, in more recent generations, Aristotles original works have once again become an important source. More recent authors influenced by this work include Alasdair MacIntyre, Hans-Georg Gadamer, Martha Nussbaum, the Latin, which is commonly used, can be Ethica Nicomachea or, De Moribus ad Nicomachum. Westminster School is an English independent day and boarding school located within the precincts of Westminster Abbey. It has the highest Oxford and Cambridge university acceptance rates of any school or college in the world. With origins before the 12th century, the tradition of Westminster probably dates back as far as AD960. Boys are admitted to the Under School at age seven and to the school at age thirteen. The school has around 750 pupils, around a quarter are boarders, most of whom go home at weekends and it is one of the original seven public schools as defined by the Public Schools Act 1868. Charging up to £7,800 per term for day pupils and £11,264 for boarders in 2014/15, Westminster is the 13th most expensive HMC day school and 10th most expensive HMC boarding school in the UK. In 1540, Henry VIII ordered the dissolution of the monasteries in England, including that of the powerful Abbots of Westminster, the Royal College of St. Peter carried on with forty Kings Scholars financed from the royal purse. By this point Westminster School had certainly become a public school, during Mary Is brief reign the Abbey was reinstated as a Roman Catholic monastery, but the school continued. Elizabeth I refounded the School in 1560, with new statutes to select 40 Queens Scholars from boys who had attended the school for a year. Queen Elizabeth frequently visited her scholars, although she never signed the statutes nor endowed her scholarships, Elizabeth I appointed William Camden as headmaster, and he is the only layman known to have held the position until 1937. Regardless of politics, he thrashed Royalist and Puritan boys alike without fear or favour, Busby took part in Oliver Cromwells funeral procession in 1658, when Robert Uvedale, a Westminster schoolboy, succeeded in snatching the Majesty Scutcheon draped on the coffin. 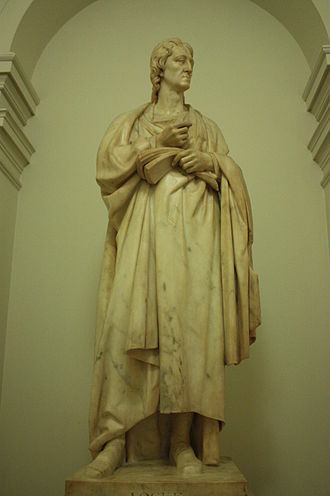 Busby remained in office throughout the Civil War and the Commonwealth, when the school was governed by Parliamentary Commissioners, and well into the Restoration. In 1679, a group of scholars killed a bailiff, ostensibly in defence of the Abbeys traditional right of sanctuary, dr Busby obtained a royal pardon for his scholars from Charles II and added the cost to the school bills. Francesco Petrarca, commonly anglicized as Petrarch, was an Italian scholar and poet in Renaissance Italy, and one of the earliest humanists. Petrarchs rediscovery of Ciceros letters is often credited with initiating the 14th-century Renaissance, Petrarch is often considered the founder of Humanism. 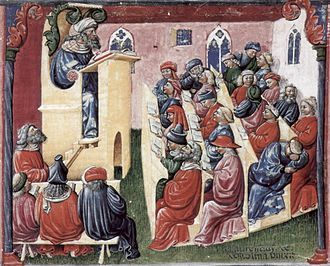 In the 16th century, Pietro Bembo created the model for the modern Italian language based on Petrarchs works, as well as those of Giovanni Boccaccio, Petrarch would be endorsed as a model for Italian style by the Accademia della Crusca. Petrarchs sonnets were admired and imitated throughout Europe during the Renaissance and he is known for being the first to develop the concept of the Dark Ages. This standing back from his time was possible because he straddled two worlds—the classical and his own modern day, Petrarch was born in the Tuscan city of Arezzo in 1304. He was the son of Ser Petracco and his wife Eletta Canigiani and his given name was Francesco Petracco. The name was Latinized to Petrarca, Petrarchs younger brother was born in Incisa in Val dArno in 1307. Dante was a friend of his father, Petrarch spent his early childhood in the village of Incisa, near Florence. He spent much of his life at Avignon and nearby Carpentras. He studied law at the University of Montpellier and Bologna with a lifelong friend, because his father was in the profession of law he insisted that Petrarch and his brother study law also. Petrarch however was interested in writing and Latin literature and considered these seven years wasted. Additionally he proclaimed that through legal manipulation his guardians robbed him of his small property inheritance in Florence and he protested, I couldnt face making a merchandise of my mind, as he viewed the legal system as the art of selling justice. 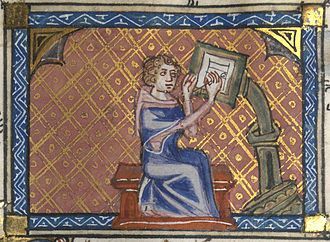 Petrarch was a letter writer and counted Boccaccio among his notable friends to whom he wrote often. After the death of their parents and his brother Gherardo went back to Avignon in 1326 and this work gave him much time to devote to his writing. 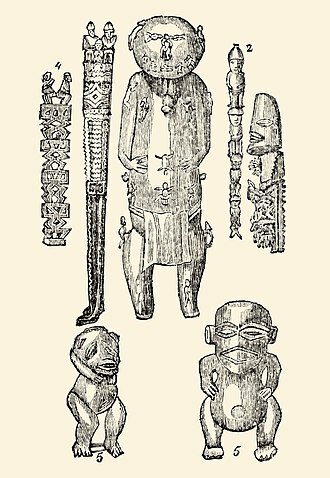 With his first large work, Africa, an epic in Latin about the great Roman general Scipio Africanus. 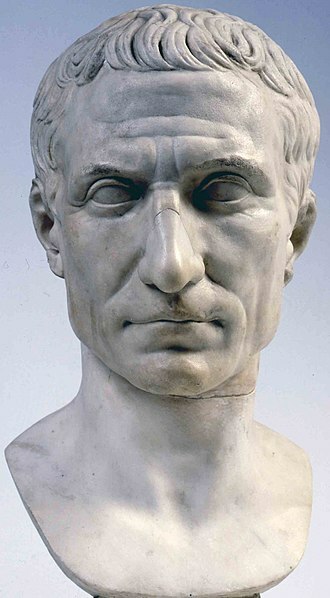 The assassination of Julius Caesar was the result of a conspiracy by many Roman senators. Led by Gaius Cassius Longinus, Decimus Junius Brutus, and Marcus Junius Brutus, Caesar was the dictator of the Roman Republic at the time, having recently been declared dictator perpetuo by the Senate. 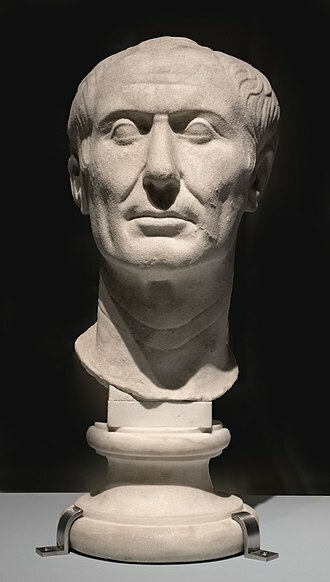 This declaration made several senators fear that Caesar wanted to overthrow the Senate in favor of tyranny, the conspirators were unable to restore the Roman Republic. The ramifications of the led to the Liberators civil war and, ultimately. Biographers describe tension between Caesar and the Senate, and his claims to the title of king. These events were the motive for Caesars assassination. 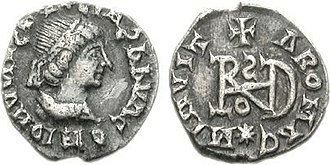 The Senate named Caesar dictator perpetuo, Roman mints produced a denarius coin with this title and his likeness on one side, and with an image of the goddess Ceres and Caesars title of Augur Pontifex Maximus on the reverse. 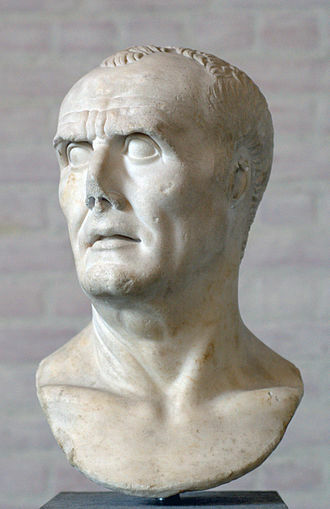 According to Cassius Dio, a delegation went to inform Caesar of new honors they had bestowed upon him in 44 BC. Caesar received them while sitting in the Temple of Venus Genetrix, Suetonius wrote that Caesar failed to rise in the temple, either because he was restrained by Cornelius Balbus or that he balked at the suggestion he should rise. Suetonius gave the account of a crowd assembled to greet Caesar upon his return to Rome, a member of the crowd placed a laurel wreath on the statue of Caesar on the Rostra. The tribunes Gaius Epidius Marullus and Lucius Caesetius Flavus ordered that the wreath be removed as it was a symbol of Jupiter, Caesar had the tribunes removed from office through his official powers. According to Suetonius, Caesar was unable to dissociate himself from the title from this point forward. Suetonius gives the story that a crowd shouted to him rex, to which Caesar replied, I am Caesar, not Rex. Also, at the festival of the Lupercalia, while he gave a speech from the Rostra, Mark Antony, Caesar put it aside to use as a sacrifice to Jupiter Optimus Maximus. Plutarch and Suetonius are similar in their depiction of these events and he places the crowd shouting rex on the Alban Hill with the tribunes arresting a member of this crowd as well. The Gail Kern Paster Reading Room at the Folger Shakespeare Library, with a First Folio in the foreground.